In this project, image denoising algorithms imposing consistency constraints on redundant signal representations are developed. The performance of simple wavelet shrinkage can be increased with cycle spinning which produces an overcomplete representation. Imposing consistency on the denoising problem of the overcomplete transform yields an iterative solution to the denoising problem via augmented-Â­â€�Lagrangian multipliers method. This approach is extended to steerable wavelet transforms. Enforcing consistency constraint on the solution to the denoising problem engaging steerable wavelet transforms, a new image denoising method is implemented. 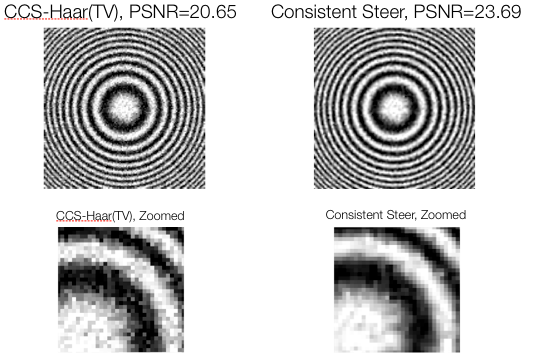 Performances of the wavelet shrinkage with consistent cycle spinning and steerable wavelet transform with consistency constraint are compared with respect to conventional denoising schemes. Possible additional developments in further work are explained.